Location. 42° 54.251′ N, 74° 34.737′ W. Marker is in Canajoharie, New York, in Montgomery County. Marker is at the intersection of Cliff Street and Shaper Avenue, on the left when traveling west on Cliff Street. Touch for map. Marker is in this post office area: Canajoharie NY 13317, United States of America. Touch for directions. Other nearby markers. At least 8 other markers are within walking distance of this marker. Sullivan-Clinton Campaign (approx. ¼ mile away); Canajoharie Academy (approx. 0.3 miles away); Northeastern Terminal (approx. 0.3 miles away); Routes of the Armies (approx. 0.4 miles away); Canajoharie/Canalway Trail/Pathway Through Mountains (approx. 0.4 miles away); Van Alstyne Homestead (approx. 0.4 miles away); Canajoharie (approx. half a mile away); Wagner Home (approx. 0.7 miles away). Touch for a list and map of all markers in Canajoharie. Regarding Shaper Quarry. The two towers were constructed by sinking cassions into the riverbed. Stone was placed atop two cassion (inverted boxes) which sank the cassions into the riverbed. Workers then dug out the earth beneath the cassion until bedrock was struck. More. 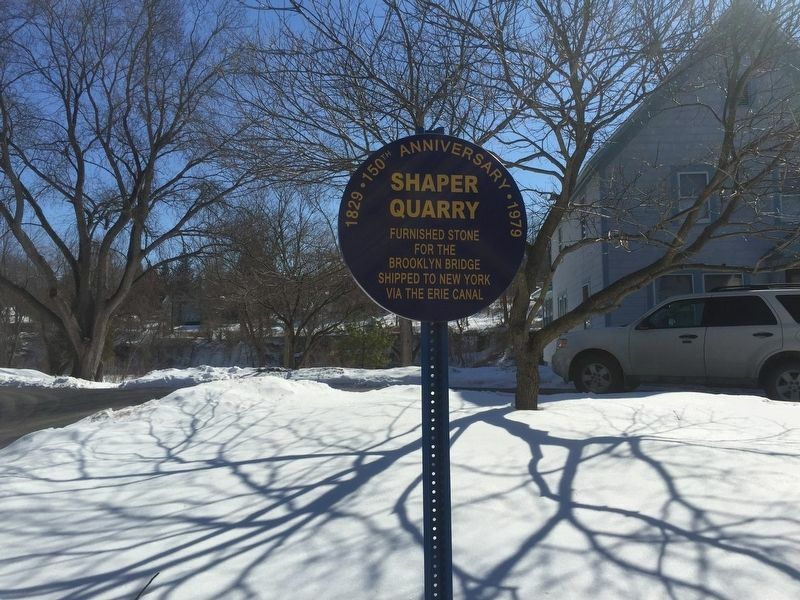 Search the internet for Shaper Quarry. Credits. This page was last revised on March 11, 2019. This page originally submitted on March 9, 2019, by Steve Stoessel of Niskayuna, New York. This page has been viewed 55 times since then. Photo 1. submitted on March 9, 2019, by Steve Stoessel of Niskayuna, New York. • Bill Pfingsten was the editor who published this page.